Heat oven to 350°F. Cook spinach as directed on box. Drain; set aside to cool. Place 1 wonton skin in each of 24 ungreased regular-size muffin cups, gently pressing skin into bottom and up side of each cup (points of wonton skin will show above cup edge). Bake 7 to 10 minutes or until top 1/4 inch of wonton skins are golden brown. Meanwhile, squeeze all excess water from spinach; place in large bowl. Stir in green chiles, mayonnaise and 1/4 cup of the cheese; mix well. 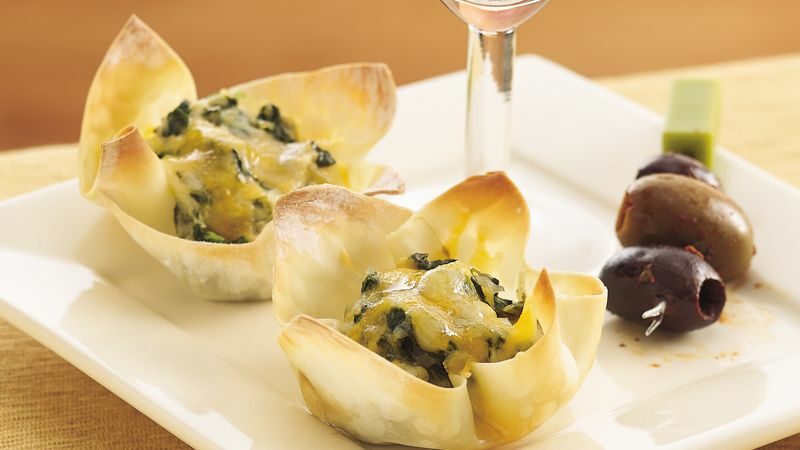 Spoon about 1 tablespoon spinach mixture into each wonton cup. Sprinkle each with 1 teaspoon remaining cheese. Bake 5 to 7 minutes longer or until cheese is melted and filling is hot. Remove from muffin cups; serve warm.